1931 Classic Spanish Remodel (Kitchen) "AFTER"
The home owners of this charming Spanish house built in 1931, asked me to help them transform their kitchen without replacing the cabinets and double oven. 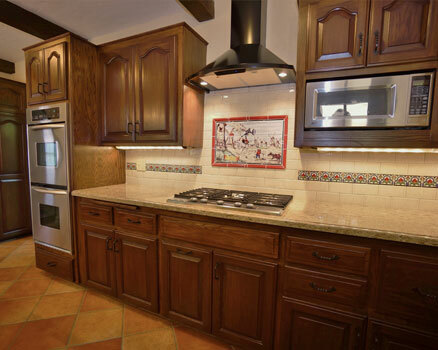 The basic layout was not changed except at the cooktop area. A new 5 burner cooktop was added as well as a decorative hood above. Other new stainless steel appliances include the refrigerator and dishwasher. The framed tile mural of a Don Quixote image is a new copy of a beloved gift from the wife’s mother from years ago. This colorful image was the basis for the selection of the other colors in the room. We selected a new quartz countertop material in a neutral beige tone and complimented it with a mottled beige subway tile. The tile liner brings in classic Spanish colors to add detail and coordinate with the colors in the featured tile mural above the cooktop. The existing oak cabinets were stripped and stained with an expresso shade to make them look richer and more up to date. The classic Spanish paver tile flooring is actually porcelain to achieve the look with minimal maintenance. New lighting was added throughout. The ceiling fixtures were replaced and a matching pendant was added over the sink. New LED under cabinets lights were also added for task lighting on the countertops. The adjacent breakfast room was also updated with a light paint color on the walls and a new glass pendant above the table.